In October of 2015, former Secretary Hillary Clinton testified for 11 hours during a hearing about her involvement in the 2012 terrorist attacks in Libya. During last night’s debate, Mrs. Clinton used the multi-hour questioning while sitting in a chair in front of the Benghazi Committee to tout that she has “stamina”. After Donald Trump was asked about a statement he had previously made about Clinton not having the “Presidential look”, he defended his statement saying he means she doesn’t have “the stamina.” The Republican candidate has often criticized his opponent for not having “stamina” but now with the health issues Hillary Clinton has faced in the past weeks, between coughing fits and a fainting spell during a 9/11 memorial ceremony, Trump has wasted no opportunity to use her downtime as a failure to keep up. However, some argue that touting the obligation to testify in front of a congressional committee for hours on end because you’re accused of mishandling a situation that left four Americans dead, including a U.S. Ambassador, is not something the brag about. Kris “Tanto” Paronto, a survivor and hero of the September 11, 2012 Benghazi attacks was working as a CIA contractor when the diplomatic compound was attacked. 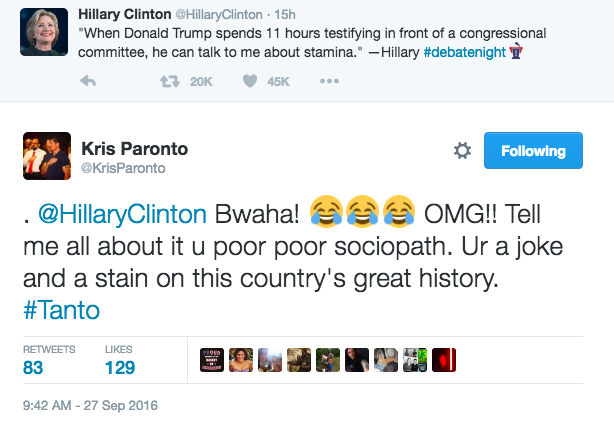 Tanto, who co-authored the book 13 hours detailing the grueling experience he and his team faced that night, took to Twitter to share what he thought about Clinton’s “11 hour” remarks. The 11 hour hearing took place almost 3 years after Clinton was originally set to testify in 2012 but she had to postpone because of major health issues including a concussion she suffered after fainting due to an illness. “While suffering from a stomach virus, Secretary Clinton became dehydrated and fainted, sustaining a concussion,” Clinton aide Philippe Reines said in a statement in 2012.